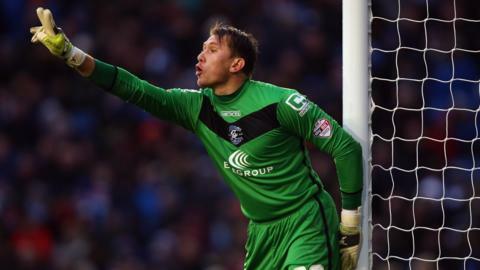 Goalkeeper Tomasz Kuszczak says he hopes his near-miss with Wolves last season will help Birmingham City go one better and qualify for the Championship play-offs this time round. Kuszczak, 33, has kept four clean sheets in five games with Blues only three points shy of the top six. "Last year was really close - just goal difference," Kuszczak told BBC WM 95.6. "We know we can achieve something - we have to be consistent, take it step by step and all stick together." After a difficult two-month spell in October when Blues won only once in nine games, they got their promotion push back on track with a run of five wins in seven - including back-to-back 3-0 victories over play-off rivals Derby and Ipswich. Two draws and one defeat has checked their charge but Kuszczak, whose move to Molineux a year ago from Brighton helped rejuvenate his career, is convinced the St Andrew's club is well placed to strike for a top-six finish. "This year is fantastic - I have established myself again and it's great to be back between the sticks," he said. "It's exciting and we're fighting for something and we're still in a good position to end in the play-offs." Despite their excellent wins over the Rams, Ipswich and drawing at title-contenders Middlesbrough, it is Blues failure to consistently beat teams in the bottom half of the table that might prove costly. But Kuszczak says recent successive goalless draws away to Bristol City and Rotherham - both in the bottom four - proves how competitive the Championship is. "Every season's the same - they are very difficult because they are in trouble and don't want to get relegated," he said. "They fight, they seem to run further, jump higher and throw themselves about to try to survive - it's instinct." Blues next game in the Championship is against Bolton at St Andrew's on Tuesday.